Stumbled across this when I wrote of Dwight Howard as a 6-9 center. Some of you just could not accept the recorded fact that Dwight Howard is six-foot-nine. This, despite a link to evidence of Howard’s barefoot height. I was astounded, perplexed and in search of even more synonyms to describe a state of utter confusion, shock, and befuddlement. We have his pre-draft measurements--his pre-draft measurements! Why do you insist on listening to some sorcerer’s Magic listing? Others believed that barefoot height does not matter because “in shoes” is the favored metric. I’ve heard it before, the argument goes: “They play in shoes.” I can be sympathetic to this logic line--for a second. In-game Dwight Howard may well tower to 6-11. But, do we record NFL player height “in helmet”? Do we weigh boxers “in gloves”? Do we act like jockeys are centaurs and measure them “on horse”? Of course not, because there is no need to tweak traditional human measurements. Moreover, there are those who aren’t listed “in shoes.” I asked around for some names of infamous height liars, and many thought Kevin Durant shaded short at 6-9. It turns out KD is just the victim of being a truth teller in a liar’s world. Per his draft combine, Durant really is a barefoot six-feet-nine-inches. But how are fans supposed to believe KD when he dwarfs a “6-9” guy who is 6-6 in real life? This is the problem with allowing a flexing metric to govern our perspective. The good news: We have more accurate information on player height than ever before. Draft prospects used to get measured at the NBA’s pre-draft camp, an experience that was bundled with an intensive five-on-five drill. Many players eschewed the camp’s game action, so they also went unrecorded. Starting in 2009, the NBA Combine allowed for athletes to undergo a physical while engaging in less strenuous drills. From that point forward, the data filled out--save for the occasional European prospect. After the draft, teams got to (and get to) determine the height of their employees. This is what you see on the player card, and this is what largely informs the public idea of how tall a player is. There is a yearly physical to keep tabs, though teams rarely make changes. For example, the Warriors informed me that Andris Biedrins is their only player to receive a height alteration over the last decade, due to a spurt that took him from 6-11 to 7-0. While I believe that teams are mostly honest in their height-recordings, the arbitrary “shoes or no shoes” allowance irks. It seems that a larger body should codify one way of doing this, rather than accept an over two-inch margin of error. And what if a team blatantly lies? I asked NBA spokesman Mike Bass about this, and he responded: “I am not aware of any instance where the team was asked (by the league) to change a player's listed height.” Perhaps I am cynical and paranoid, but I could easily envision a dystopian future where David Kahn successfully trades “7-1” Michael Beasley. PG: Jose Juan Barea (“6-0”): We don’t know Barea’s real height, but J.J. looks like he could bathe in a sealed thimble. This is my only data-blind submission, but only because Barea’s height deception is so easily seen. SG: Tyreke Evans (“6-6”): Leon Trotsky’s political strategy was to announce the next far-fetched program right as you were beginning to mobilize against his current far-fetched program. Sacramento will try to convince you that Evans is a point guard. As your brain bounces like a slapped speed bag, they’ll tell you he’s 6-6. His pre-draft height is 6-4 and unlike Trotsky, he can’t maneuver left. SF: Thaddeus Young (“6-8”): Thad is really 6' 5.75.” I could just as easily rank Donte Greene here, but Young gets the edge on account of being a more notable player. Also notable: Three teams (Wolves, Kings, Sixers) have the market cornered on height liars. This may be because they’re replete with tweeners. PF: Kevin Love (“6-10”): He measured at 6' 7.75," but that isn’t what makes Kevin Love’s height deception so dastardly. 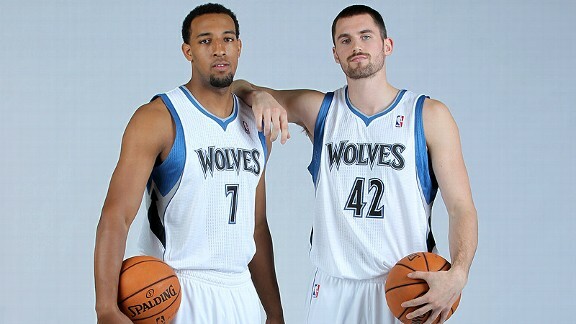 It’s that K-Love is photographed at the height level of a “6-8” Derrick Williams. Now some would say, “This makes his rebounding all the more impressive.” I’m not so forgiving. Turn in your World Championship trophy, you dirty heightener, you. C: Spencer Hawes (“7-1”): He measured at 6' 10.5,” the same as Joakim Noah did. But Spencer somehow gained a two-inch advantage on Noah in the official listing. If Hawes lacks leaping ability, it could be because he’s wearing platform shoes. I want accuracy, I want “in shoes” to be more unfashionable than socks with sandals. But as I look at this list, I can grasp why some cling to height vagaries, why you might prefer a “6-10” Kevin Love to an undersized striver. Disputed height provides more room for myth making, which is the essence of sports entertainment. These are the fables we tell each other, so as to inspire and awe. And if the sheer height of the giants animates our stories, can you blame people for wanting the freedom to embellish another inch or two? “In shoes,” is a license to take a man and make him Paul Bunyan. “In shoes” is so close to reality that it makes Paul Bunyan feel real. Since he was picked in medieval times, we have no pre-draft record of Kevin Garnett’s stature. In hushed tones, basketball fans rasp, “You know, he’s really 7-1. He just hides his true height.” Perhaps he does. I would be quite disappointed to learn that there really is no psychological reason behind Garnett’s listing, that he really is a barefoot 6-11, that he only seems bigger in my mind’s eye. That one-to-three inch “in shoes” zone means a player can be tall as your imagination reasonably dictates. Even the doubt sown by a short-seeming listing can trigger Bunyan visions. But I’m an “in socks” fanatic, congenitally averse to myth. I just want to know how tall Kevin Garnett is. And I just want you to know how tall Kevin Garnett is.